This is Yoshiaki Hirabyashi, producer at R&D Division 1. He is here to tell us that there will be an official remake of Resident Evil 2. "The project has finally been approved for development!" 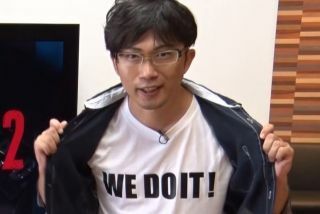 says Hirabyashi, before opening his shirt to reveal a T-Shirt bearing the words "WE DO IT!" "You've been telling us for years that you want Resident Evil 2 to be remade," he adds. "We haven't been able to make it happen...until now!" He warns that we're unlikely to hear more about the project for a while as it's just been greenlit. The word "remake" suggests an involved update, but we'll have to wait and see how R&D Division 1 choose to renovate Raccoon City. He doesn't mention platforms either, but Capcom released a HD remaster of the first Resident Evil game on PC in January this year, and we liked it a lot, giving it a score of 80 in our review.